(CNS): A large area of cloudiness, shower and thunderstorms over the northwestern Caribbean Sea is causing inclement weather that may give rise to localized flooding weather forecasters have warned. According to the national hurricane centre in Miami the upper-level conditions are not expected to be particularly conducive for development of this system into a storm but areas of heavy rainfall are expected during the next couple of days over the Cayman Islands and Cuba. The NHC states that the system currently only has a 10 percent of becoming a tropical cyclone during the next 48 hours as it moves northwestward at between 5 to 10 mph. Meanwhile, the third storm of the season formed at around 4pm local time at high latitude in the Atlantic. 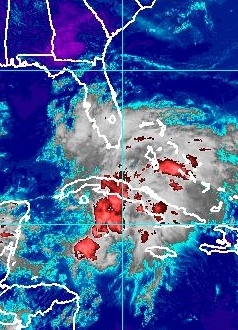 Although temperatures are expected to reach the low 80’s, the Cayman weather service said that there is a 60% chance of showers and thunder on Wednesday with heavy local showers leading to flooding of low lying areas. Winds are southeast at 10 to 15 knots with higher gusts. Seas will be moderate to rough with wave heights of 4 to 6 feet and small crafts should exercise caution over open waters, the service warned. Similar conditions are expected tomorrow night with temperatures falling to the upper 70’s with gusty winds and rough seas are likely near showers. Thursday calls for similar conditions until the cloudiness begins to gradually decrease as the area of low pressure moves west of our area. gusts and little change in strength is expected during the next 48hours before Chris becomes a post-tropical cyclone on Wednesday night or Thursday.